The mission report of Patricia Lalonde, the European Parliament's rapporteur on the proposed EU-Morocco trade deal for Western Sahara, is remarkably void of facts and figures. WSRW retorts. All Saharawi groups have protested the EU plans for a trade deal for Western Sahara. All are falsely claimed to have been consulted in the EU's consultation process. Nearly none of them met with the European Parliament's mission to Western Sahara in September 2018. As part of the European Parliament's assessment of the Commission's proposal to extend the EU's trade deal with Morocco to Western Sahara, a two-day fact finding mission to the territory was undertaken on 3-4 September 2018. Leading the mission was French liberal MEP Patricia Lalonde, who is the Parliament's rapporteur on the proposed trade arrangement for Western Sahara. Ms Lalonde will formally present her mission report to the EP Committee for International Trade on 5 November, but the report is already publicly available. Find Ms Lalonde's mission report on Western Sahara here. The mission report presents no information on technical aspects relating to the envisioned future EU-Western Sahara trade. In addition, it hardly addresses the opinion of the people of Western Sahara. Western Sahara Resource Watch encourages all Members of the European Parliament to rigorously scrutinize Ms Lalonde's report. Find our own facts and figures below or through this link. 1. On 19 September 2018, MEP Patricia Lalonde made public her mission report following the visit to Western Sahara on 3 and 4 September 2018, for the European Parliament’s Committee on International Trade. 2. The mission was composed of three MEPs from the groups of the Liberals (ALDE), Greens and EFDD. For unexplained reasons, the members from the EPP and S&D cancelled their participation at the last minute. Therefore, the participating MEPs represented only 20% of the European Parliament’s political composition. 3. The rapporteur’s introduction - that “the mission programme centered on six meetings with associations representing Saharawi civil society, two meetings with the official authorities, a meeting with a human rights association, a meeting with the French Chamber of Commerce and six field visits” – creates the impression that meetings with Saharawi civil society were at the heart of the mission. However, further reading presents a different view. -	240 minutes (or 22% of the programme) was spent with actual NGOs, receiving 9% in the report. -	465 minutes (or 42% of the programme) was spent on meetings with the business sector, and are covered by 50% of the mission report. -	270 minutes (or 25% of the programme) was spent on meetings with local authorities, and covered by 35% of the report. Nearly 80% of the programme has been spent on meeting Moroccan interlocutors or with actors that have a direct (economic or political) interest in having the proposed Protocol approved. Only 20% of the interlocutors could be suspected to potentially having opposing views – and they are granted but 9% of the mission report. A meager result for a “fact-finding mission”. 4. An overwhelming part of the mission’s time in Western Sahara was spent on meeting actors that were already part of the EU External Action Service’s consultation process, and who as such had already had a chance to voice their position. The mission could have made the effort to reach out to Saharawi groups to get a better understanding of their position. Instead, it chose to meet with the exact same Moroccan economic operators, elected politicians and civil society groups that were already in contact with the EEAS. A missed opportunity – and a costly one for a mission paid by European taxpayers. 5. The EEAS claims to have “consulted” 112 associations and individuals. However only 18 of them (or 16%) – all Moroccan bodies – were in fact consulted by the EEAS, rendering the Commission's assertion to have found a “broad” support for a new trade agreement rather questionable. 91% of Ms Lalonde’s mission report is thus given to the position of 16% of the stakeholders allegedly consulted by the EEAS. The mission report does not refer to any of the 94 groups that the EEAS falsely claims to have consulted, except two. More space in the mission report is given to minutes from the meeting with the French Chamber of Commerce, than to meetings with Saharawis – the very people of the territory. 6. One of the three traveling MEPs, Ms Heidi Hautala, tried to meet with more people of Western Sahara and reports being confronted with a “textbook method of harassing the human rights defenders”. Her account of the mission is quite different than that of rapporteur Lalonde, who fails to mention the police brutality inflicted on Saharawis who tried to meet the mission. Read 'MEP: Reality of my three days in occupied Western Sahara' in EU Oberver, 11 October 2018. 7. The mission did not visit all parts of Western Sahara; only those under Morocco’s control. 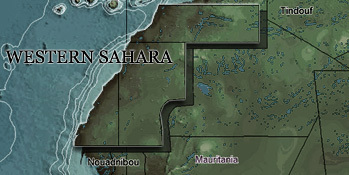 The mission did not visit or meet with interlocutors living in the part of Western Sahara that is not under Moroccan control yet represents one third of the territory and where there are economic actors who would be interested in exporting their goods to the EU and in any event, where the issues of benefits and consent are equally relevant. Furthermore, the mission did not visit the substantial part of the people of Western Sahara who live in refugee camps in southwest Algeria. 8. Nearly the entirety of Ms Lalonde’s report relates to the alleged benefits of having a trade scheme in place for Western Sahara. The EU Court of Justice has explicitly stated (paragraph 106) that this aspect is irrelevant. Ms Lalonde’s own draft report admits that this was added by the Council and that it is not in the ECJ requirements. Yet the mission report does not elaborate on the core requirement of the ECJ which is the need of securing the consent of the people of Western Sahara. 9. The mission met with officials elected in Moroccan elections organized in the part of Western Sahara that it holds under occupation. Those elections have no legal basis, as Morocco has no sovereignty over the territory. It is astonishing that representatives of the EU, which does not recognize Morocco’s self-proclaimed sovereignty over Western Sahara, should provide tacit recognition of such unfounded elections by choosing to meet with these officials who cannot be viewed as representing the territory. It should also be noted that Saharawis who advocate for the exercise of their right to self-determination cannot take part in elections – as their position is considered as a criminal, and punishable, offense (that of threatening national unity). Would Mrs Lalonde have ever considered leading an INTA “fact-finding mission” to Crimea, where she would have discussed with Russian GONGOs, officials elected under Kremlin-held elections (and not recognised by the EU) and the Russian Chamber of Commerce? 10. While being a “fact-finding mission” of the EP’s International Trade Committee, the report does not contain any content on fundamental trade-related issues, such as the certification and traceability of products. There is no information about the number of European companies in the territory. The (non-) collection of data on past and current EU trade with Western Sahara is totally ignored. The ownership and staff composition of the agriculture and fish processing companies that stand to gain from the agreement are not addressed. 11. In her interview with Moroccan media already on the first day of the mission (to the right), Ms Lalonde stated that it was "obvious that it is not possible to block the economic development in a region that needs it", implicitly meaning that it is necessary to include Western Sahara in the deal. Is that in line with the wishes of the Saharawi people? What is the point of a fact-finding mission, when its conclusion has so obviously been crafted a priori? Was she speaking on her behalf, on behalf of the mission or on behalf of the EP Committee on International Trade? Why then bother with drafting a report or even a mission altogether?